Significant costs in time and resources to re-architect databases for the cloud. 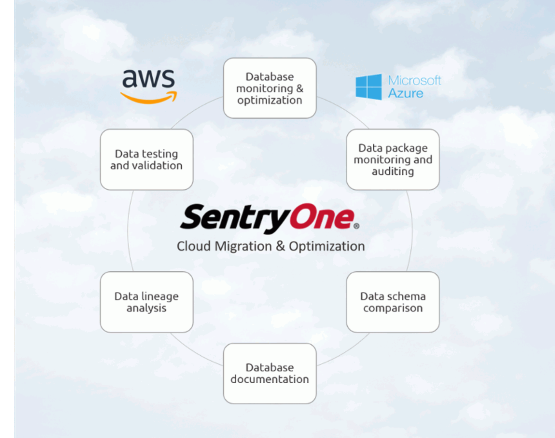 From data testing and validation through monitoring and optimizing performance of cloud-based databases, SentryOne has a full suite of capabilities that can simplify your journey to the cloud. A marketplace image on Amazon Web Services, with support for both Amazon RDS for SQL Server and Amazon EC2. A marketplace image on Microsoft Azure, with support for both Azure SQL Database and Azure SQL Data Warehouse. Support for monitoring Azure SQL Database Managed Instance, a deployment model of Azure SQL Database released by Microsoft that provides near 100 percent compatibility with on-premises SQL Server. As a longtime partner of both AWS and Microsoft, SentryOne has developed proven solutions to help you shift your business-critical databases from on-premises to hybrid or multi-cloud environments—while maintaining data integrity and ensuring fast performance. From data testing and validation to optimizing cloud-based workloads for peak performance, SentryOne provides the solutions to make your journey to the cloud both fast and accurate. Get started with SentryOne via the Azure Marketplace Image, AWS Marketplace Image, or by downloading our free trial.